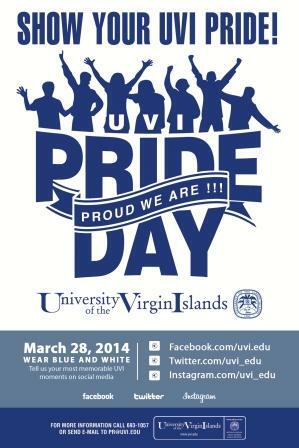 During UVI Pride celebrations, the university took pride in and recognized UVI alumni, students, and programs. Staff, faculty, and students displayed their UVI Pride by wearing the school colors, blue and white, as well as other UVI branded clothing. There were major campus-wide events on both St. Croix and St. Thomas, where our community mixed and mingled in a fun and festive atmosphere of live entertainment, competitive games, music, cultural workshops, and light refreshments. UVI Pride was not limited to our campuses. During the celebrations, we will also be demonstrated our pride in the community by visiting each of the four public high schools in the US Virgin Islands. At each school, there was a rally-type atmosphere. Alumni employed at the schools wore UVI colors. High school marching bands, representatives from our various schools and colleges, UVI student organizations, sports teams and the UVI cheerleaders participated in events. Additionally, we engaged alumni throughout the USVI and the Eastern Caribbean. Our elected government officials showed their UVI Pride by wearing UVI branded clothing. Alumni representatives in our Dedicated Alumni Recruitment Team (DART) in St. Kitts/Nevis, Anguilla, St. Martin, and Antigua demonstrated their UVI Pride in their respective islands. The University of the Virgin Islands' Hospitality and Tourism Management Program is ranked 26 in a list of "50 Most Affordable Small Colleges for Hospitality Administration and Management". During Fall 2015, the hospitality program included 83 students with 25 taking classes on St. Croix and 58 on St. Thomas. That number includes transfer students from neighboring islands including the British Virgin Islands and Dominica. Three students from the inaugural class graduated from the program in May 2015 with a Bachelor of Business Administration degree in Hospitality and Tourism Management. Along with their classroom training, students participate in activities such as the Ritz Carlton Customer Service Training. The UVI cafeteria has collaborated with the hospitality program, allowing students to assume numerous roles in the front and back of the dining facility. The combined in-class and community training has made the program a stellar one. Click to learn more . . . The University of the Virgin Islands’ new Innovation Centers is a space for student ideas and collaboration that allows dreams to take form. This spring, UVI showcased its state of the art Innovation Centers with open houses. Each Center is outfitted with computers, work tables, white boards and a 3-D printer – from which models or product prototypes can be digitally rendered out of biodegradable plastic. The Innovation Centers are located in the Paiewonsky Library on the St. Thomas Campus and the Evans Center Library on the Albert A. Sheen Campus on St. Croix. President David Hall received the national Thurgood Marshall College Fund (TMCF) Educational Leadership Award and the VI Hotel and Tourism Association Award of Excellence. President Hall was presented with the TMCF Educational Leadership Award at the 27th annual Thurgood Marshall Awards Gala in Washington, D.C. last fall. The award is the highest individual award presented annually to a president of an HBCU who has demonstrated outstanding business, academic and visionary leadership through effective management of his or her institution. Scott Eanes, a graduate student in the Marine and Environmental Science Program, was the pioneer behind the naming of the body of water just south of the Cyril E. King International Airport, now named — Hawksbill Cove. The cove was created artificially as a result of the airport’s reconstruction. In the midst of writing his thesis on the critically endangered Hawksbill sea turtles, Eanes decided that the cove deserved a name, and that it would be best to name it after its most important resident. After a six month-long application process, the Board of Graphic Names voted unanimously to name the cove after the endangered turtle. DeWein Pelle, a junior Mathematics major and HBCU-UP Research Fellow, won the second place award in mathematics and statistics at the Emerging Researchers National (ERN) Conference in STEM, in Washington, D.C. The purpose of this conference is to help undergraduate and graduate students enhance their science communication skills and to better understand how to prepare for science careers in the global workforce. Pelle plans to attend graduate school in civil engineering with a concentration in construction engineering and management. He is a university innovation fellow, a junior senator of UVI’s Student Government Association, vice president of UVI’s National Society of Black Engineers (NSBE) and a Golden Key International Honour Society member. Pelle was mentored by UVI Professor Dr. Robert Stolz. 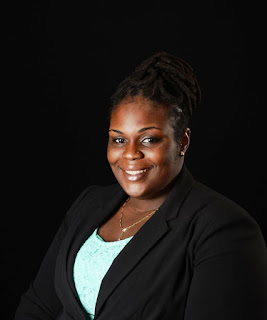 UVI Alumna, Dr. Charnise Goodings, (‘09) earned her Ph.D. in cancer biology in 2015. Currently, she is a postdoctoral fellow at St. Jude Children’s Research Hospital. Dr. Goodings’ research projects are based on the study of cancer biology, specifically leukemia. The research is aimed at understanding the role of certain genes in the development of normal and malignant lymphoid cells. Dr. Goodings, Emerging Caribbean Scientists Program's research seminar speaker, told students she learned good work ethic at UVI. “You have to be responsible for yourself, your research, and your own work,” she says. Stephan Moore, dean of students on the Albert A. Sheen Campus on St. Croix and interim vice provost of Access and Enrollment Services, received the 2016 African American Knowledge Community (AAKC) Sankofa Award from the National Association for Student Affairs Administrators (NASPA).